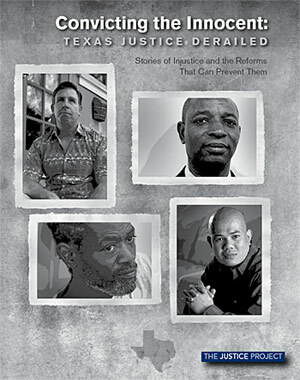 A new report released by The Justice Project, “Convicting the Innocent: Texas Justice Derailed,” analyzes the cases of 39 innocent Texans who collectively spent more than 500 years in prison for crimes they did not commit. The study focuses on these non-capital crimes as it recommends reforms Texas should implement to improve the quality of evidence used and reduce the risk of wrongful convictions. Eyewitness misidentification was the leading cause of wrongful convictions in Texas, where only 12% of law enforcement agencies have written procedures to guide the eyewitness identification process. Many other cases contained faulty or absent DNA or flawed forensics from police crime labs. Other factors leading to wrongful convictions included false confessions and guilty pleas, suppression of exculpatory evidence, false testimony from informants or accomplices with incentives to lie, false forensic testimony, and unreliable or limited forensic methodologies. The full report is available here. (R. Khanna, “Study: Witness errors lead juries astray,” Houston Chronicle, March 26, 2009). See Studies and Innocence.